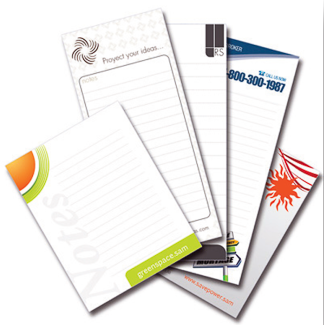 Memo pads are an inexpensive yet powerful way to keep your business in front of your customers so they remember to use your products or services. They are usually printed on high quality 20/50 bond paper that is easy to write on and makes your design stand out, with other optional stocks to choose from. There are several standard sizes to choose as well as custom sizes to give you plenty of design options. They can be printed black and white to full color. They are made with a chipboard backing for increased dimensional strength and durability. You can create custom printed memo pads in just about any size you want. Slight deviations from the standard sizes are common as they usually don't cost any more to produce, yet add some distinctiveness to the pad. And don't forget horizontal and square formats for something visually different. Another feature of memo pads that can be customized is the number of sheets per pad, which commonly ranges from 10 to 100 with 50 being the most common.